Today's tip is a little controversial. There has been a lot of drama around Verge. But when you look at things objectively, it might be a good buy. It all depends if the market can restore its faith in Verge. Here is my view on Verge. There are many privacy coins out there (ZCash, Monero, Dash, PIVX, NavCoin, ...) but they don't all focus on the same privacy issues. Most try to solve the privacy of transactions or the privacy of wallets. When you make a bitcoin transaction, everything is visible on the blockchain. If people can find out a wallet address belongs to you, they can calculate the amount of bitcoin you own for that address. Some privacy coins try to solve that by encrypting transactions, others combine transactions so it is no longer possible to link a wallet to the amount of the transaction. Verge has a different approach. Because transactions take place over the internet, users could still be traced via their IP addresses that are logged by nodes processing transactions. When you have someone's IP, you can actually trace his physical location. If you happen to own a lot of cryptocurrencies, you want to prevent criminals to find out your address. Or if you happen to live in a totalitarian regime like Iran or Turkey, you don't want the government to trace all your activities and find out where you live. As far as I know, Verge is the only cryptocurrency today that tries to solve this issue. There has been a lot of drama concerning the Wraith upgrade. It was promised at the end of Q4 2017. And they also delivered the upgrade. Ok, they had a few hours of delay given their timezone and there were a few minor issues with the first release, but that is pretty normal in software development. A lot of drama and FUD have been made on this upgrade, mostly by people that have no idea how software development is done. people looked at the public github repository and cried about lack of updates. No decent dev team would push changes directly to the public github during development stage. others looked at Hudson and complained about lack of integration tests. Again, who is to say this is the only integration server the team has running? A number of deliberate attacks have been made to damage the reputation of Verge. The last one is still being shared by leaders in the cryptocurrency field even though it has been debunked as false evidence. The claim that Verge is leaking IP addresses was a deliberate attack using a script to create false evidence. 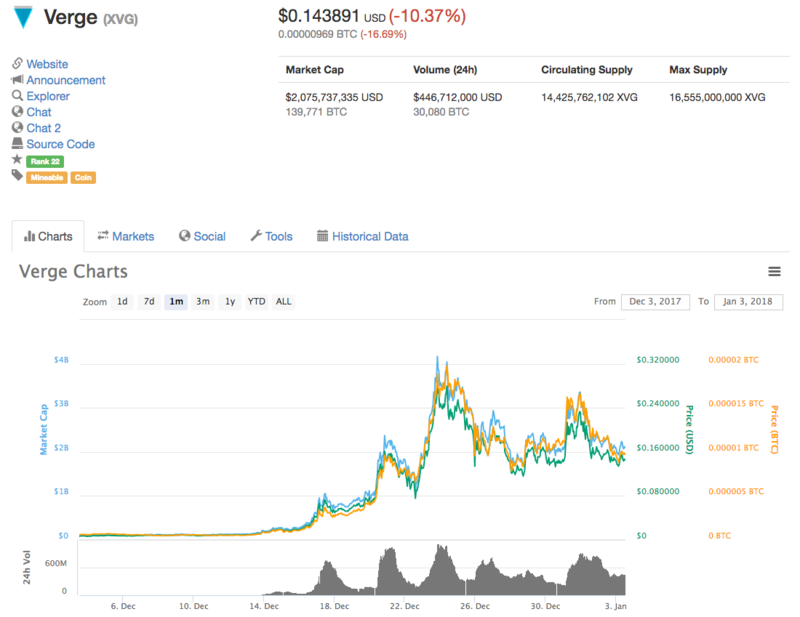 The full saga of what happened to Verge in December is nicely summarized in this article: https://cryptoclarified.com/2018/01/01/635/. So many organized attacks makes me wonder if this is only about greed (trying to drop price to buy in at lower levels) or are competitors scared about the Verge technology? I don't have the answer but it is food for thought. Verge is still a risky investment. I'm not sure how long it will take for them to recover from all the attacks on their reputation. But if the technology is strong enough, we are likely to see more objective reports on the performance and security of the Wraith upgrade. If these are positive, the value of Verge will get a boost. In that case, the $0.14 price today is a bargain. It's up to you to decide, I'm just sharing my observations.